Well, it’s that time of year again! I’m not sure where the time has gone and I feel like Christmas kind of snuck up on me this year. Sure I did some baking, got the Christmas tree up and shopped for pressies, but the one thing I had to leave to the last minute due to my work schedule was this post. I didn’t want to leave our readers hanging, and had to put something together for you all so without further ado, let’s get into some vampire Christmas goodies. Vamped has grown a lot in the last year and we have made some amazing connections due to our articles and research. I wanted to do something special this Christmas so I suggested we do our own personalized Vamped Christmas cards. Anthony loved the idea and even had the ideal picture in mind for the cover. We set to work in our Vistaprint account and after some tinkering ended up with something we were both loved. Only twenty of these were printed and nineteen shipped around the world. I had to keep one for sentimental reasons. The hard part was culling down our list of lucky recipients, which took some time. I managed to print some vampire return address labels too that looked quite stylish. With the holidays around the corner, we know vampires and humans get rather thirsty so we have something appropriate for everyone. Keep in mind this is the blood free version, folks! 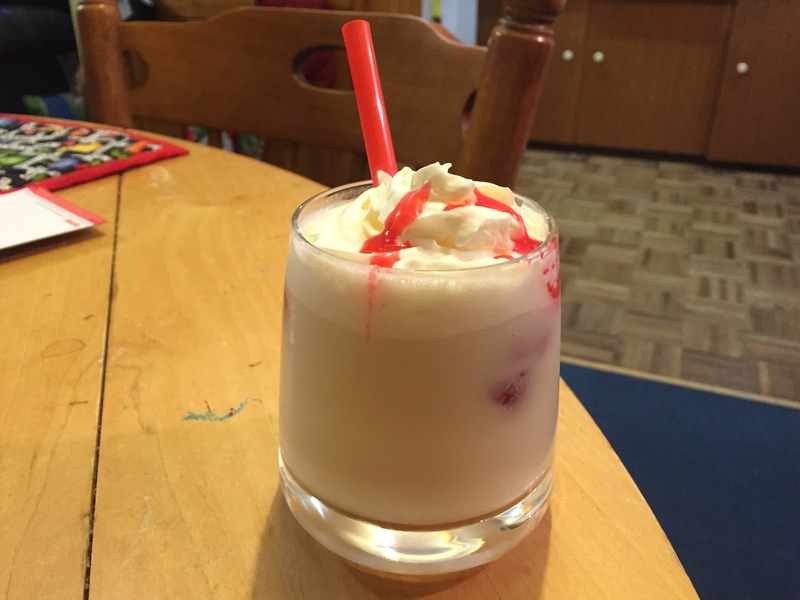 Combine eggnog, Triple Sec, and rum in shaker with about 5 ice cubes. Shake and pour into glass of your choice. Having troubles with some last minute Christmas gifts ideas for your loved ones? Maybe you should pick up a few seasons of True Blood? They are great for the whole family. “True Blood: True Blood for the Holidays,” YouTube video, 0.30, posted by trueblood, Nov. 23, 2011, accessed Dec. 21, 2015, https://youtu.be/p91VTAFsBoc. We all know Santa has a hard gig; delivering presents to all the good little girls and boys around the world in one night, but who knew he had a second job. I think he has been getting some of his moves from Blade. “Santa Claus: The Vampire Slayer,” YouTube video, 4.28, posted by IndyRiot, Dec. 23, 2013, accessed Dec. 21, 2015, https://youtu.be/YA8QmjSpgBs. 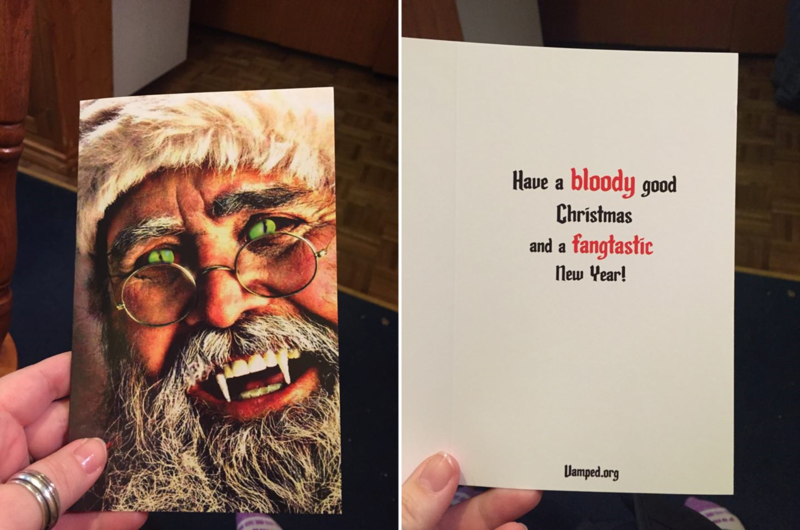 If Santa slaying vampires wasn’t enough fun for you, how about vampire Santa? Sal Lizard frequents conventions dressed as the jolly old man himself, with some added vampire style. He’s not just hungry for cookies and milk either. “Vampire Santa,” YouTube video, 2.03, posted by Richard Hamilton, June 20, 2012, accessed Dec. 23, 2015, https://youtu.be/Ymogw2XBulw. I hope you all enjoyed our Vamped Christmas cheer, but it’s time for me to scoot for some festivities of my own. I still have some pressies to wrap and butter tarts and a cheesecake to bake for Christmas day. Anthony and I wish all our fans and readers a merry Christmas! Stay safe, happy holidays and remember vampires, don’t feed and drive. 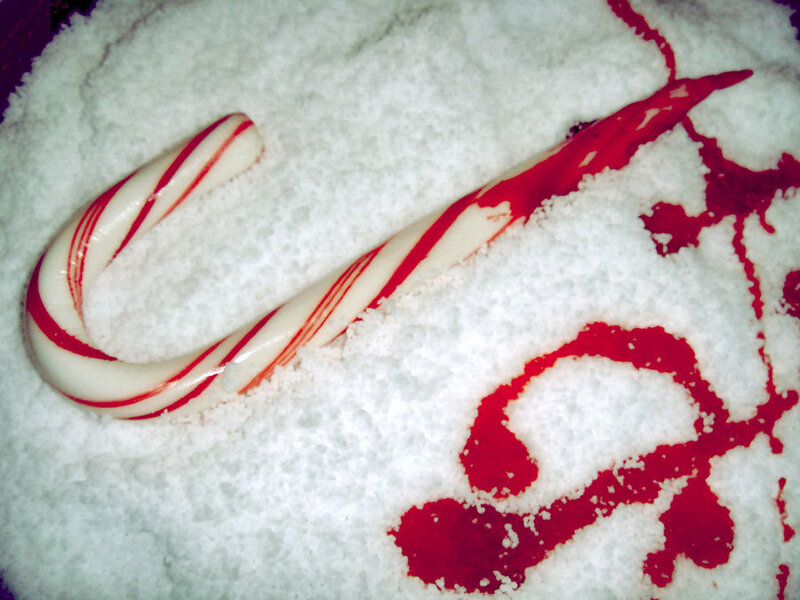 Erin Chapman, “Merry Christmas!” Vamped, Dec. 25, 2014, http://vamped.org/2014/12/25/merry-christmas/. Last years’ Christmas post.